Vinnie Paz: I’ve been writing rhymes for awhile. I don’t remember the first actual song. The first material that I let out to the public was through the first incarnation of JMT (Jedi Mind Tricks) called Soulcraft. We handed out our little demo tapes around Philly. That was 1992 - ‘93, I think. MVRemix: Tell me about the album, "A History Of Violence." How did the title come about? Vinnie Paz: Explaining titles sort of diminishes them. I think people should be free to take their own meaning from. It’s kind of a statement about American imperialism. MVRemix: Did you see the film? Vinnie Paz: Yeah. It’s a dope movie. I like David Cronenberg’s work. MVRemix: How long did the record take to record and how planned was it - ie did you set out with a track listing and stick to it or record a number of songs and chose a select amount leaving the rest on the "cutting room floor"? Vinnie Paz: We usually work the same way each time out. It takes Stoupe longer to do his part, so he’s usually working on beats for 6 months to a year before I record. Before we cut vocals, we get together and listen to beats and talk about which beats we think fit the vibe of the record we’re trying to make. We’ve always been the type of group to make albums, instead of singles, so we’re always looking for a collection of songs that fit a vibe. MVRemix: Any videos in the works? 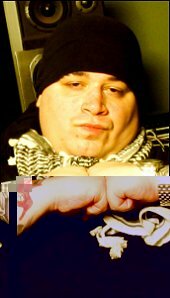 Vinnie Paz: We have our DVD, “Divine Fire,” coming out in early 2009. We spent a good year putting that together. We’re real proud of that. It gives our fans a chance to go behind the scenes of our career from ’96 until now. MVRemix: Which song on "A History Of Violence" took you the longest to complete? Vinnie Paz: “Death Messiah” took longer. Concept joints usually take me longer to write. Vinnie Paz: This is strange, because I usually do the concept songs last, but I wrote “Trail of Lies” the quickest. That was an idea that was floating in my head for awhile, so I knocked that out as soon as we got started. MVRemix: You've been rapping now for quite some time, how has your career changed as time has gone on? Vinnie Paz: I’ve just tried to remain consistent. A lot of groups have disappeared from when Stoupe and I came into the game in the 90’s. We’re real fortunate to still be doing this for a living, but we’ve always approached our careers from a different mindset. We never set out to be a flash in the pan type group. We set out to carve out a niche for ourselves and that’s what we’ve done. We’ve been fortunate to find a big enough fan base to support what we do. MVRemix: Do you pay attention to indie Hip Hop or do you typically listen to another genre of music and simply compose indie material? Vinnie Paz: I don’t pay attention as much as I once did. Don’t get me wrong, I’m still a fan of music in general. I’m probably one of the last people that still buys CDs. There’s just a real glut of bad music out there these days whether you’re talking indie rap or any other genre. The internet is a blessing and a curse. It gives talented people a forum but it also gives a lot of untalented people a forum. Vinnie Paz: I’m happy, man. Hopefully, he does bring the change we desperately need. We’ll see. Vinnie Paz: It’s tough on everyone. We’ve always run our business with our fans in mind. We try to price our show tickets and merchandise fairly. Some things we have more control over than others. We’re going to try to do more of our own ticketing for future tours to keep those prices down. We don’t like seeing our fans taken advantage of. That’s why the music business is where it is... too many years of taking advantage of fans. MVRemix: What's the biggest misconception people have of you? Vinnie Paz: I’m not always angry. Vinnie Paz: I think more in terms of albums than songs. Violent by Design was a milestone and a turning point for us, but Servants in Heaven, Kings in Hell is probably our most complete record. Vinnie Paz: I watch boxing. I just got back from tour, so I’m catching up on the Sixers now too. Vinnie Paz: Kanye [West], maybe Usher. MVRemix: Would you win either of them? Vinnie Paz: We’re about to get in the studio and work on AOTP 3. We also have our DVD, “Divine Fire,” coming out in January. "Explaining titles sort of diminishes them. I think people should be free to take their own meaning from."